The sign is a reminder of the vibrant commercial activity that grew in the city from the 1950s to the end of the millenium. 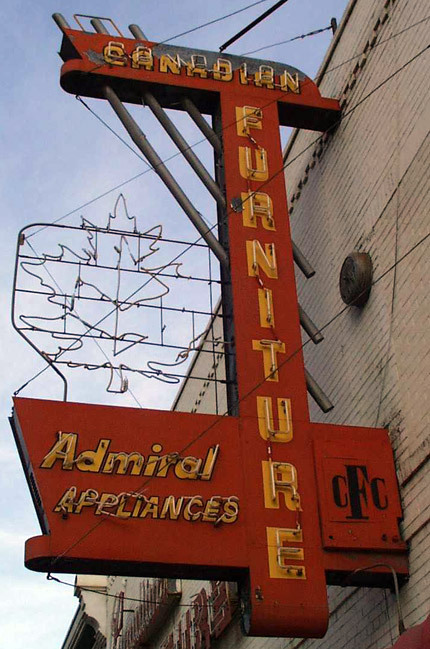 Furniture stores and "exchanges" were common in Edmonton beginning with the first immigration boom in the early 20th century. Many newcomers were on the move constantly as they settled into their latest home, while a large upwardly mobile segment of the population also felt the need to change their furnishings as they could afford them. This created commercial opportunities that were specific to that time, but were also renewed with every wave of immigration during periods of increased economic activity in the city. Sam Dolinko's Edmonton Furniture Exchange was one such business. Samuel Dolinko was the proprietor of the business carried on under the names Canadian Furniture Store, Canadian Furniture Company and Canadian Furniture Exchange. Sam Dolinko began working in Edmonton in 1933, during the height of the Great Depression. He opened Canadian Furniture Company store on 97 Street near 103 Avenue in 1936. Sam and his wife Cila, and his son Max Dolinko, who managed the business and saw it expand after the 1970s, were the principal operators of the thriving business for decades. As one of Sam's grandsons noted, "My grandparents created the store; my father gave it life." The company closed in January 1998, but only after serving Edmonton for close to five decades during its postwar growth and expansion.